This recipe called for overnight marination, but I was not prepared, by the time I start to prepare for dinner and read the recipe it was too late for any type of marination. The finished dish was very flavorful so I assume if you prepared it properly (according the original recipe), it would have been even better tasting. 1.Combine the hoisin sauce, honey, oil, rice wine vinegar, garlic and black pepper in bowl. 2.Cut the ribs into serving size pieces and place in extra large heavy plastic resealable bag, pour the sauce over the ribs. 3.Seal the bag and place in a large bowl, refrigerate overnight. 5.Line a large baking sheet with heavy foil. 6.Arrange the ribs bone side down on the foil. 8.Set the oven to 350 degrees. 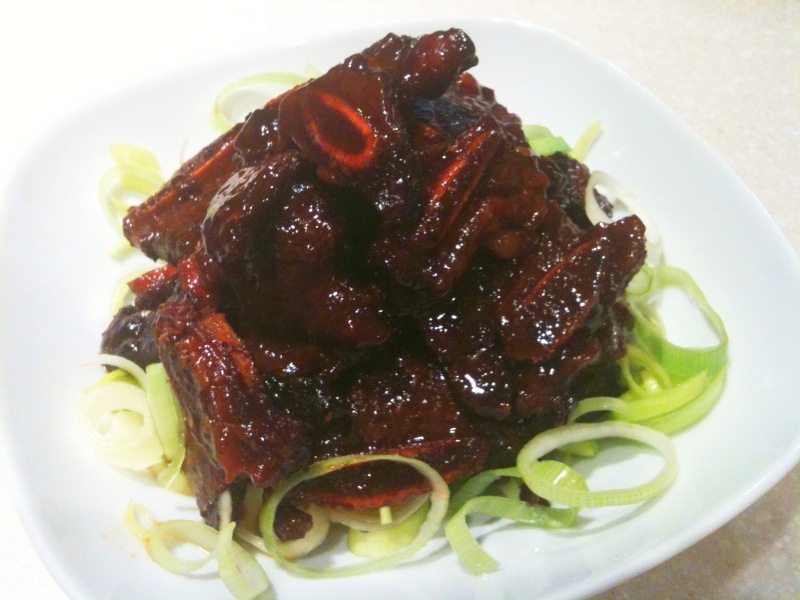 9.Bake the ribs for about 40 minutes covered, then 20 minutes uncovered or until cooked through. 10.If you prefer, sprinkle a little brown sugar on top then broil the ribs for 2 minutes before serving.